Explosive batsman Kevin Pietersen, who became the first Delhi Daredevils player to don the new team uniform at the ICC Global Cricket Academy here today, said he is looking forward to playing alongside many exciting players like Virender Sehwag, David Warner, Mahela Jayawardene and Morne Morkel. “There is no doubt that the Indian Premier League is an exciting competition and I am delighted to back after having to miss out last season because of a surgery. When I look at the squad list, I am sure that Delhi Daredevils will regain the consistency it has shown in the first three editions when it won 24 games,” he said. Mr Sekar, who is also Team Mentor, said the squad has been restructured with a view to be competitive through the season. “Kevin’s transfer from Hyderabad, the successful bidding for Mahela Jayawardene and young all-rounders Andre Russell (West Indies) and Douglas Bracewell (New Zealand) are all steps in that direction,” he said. 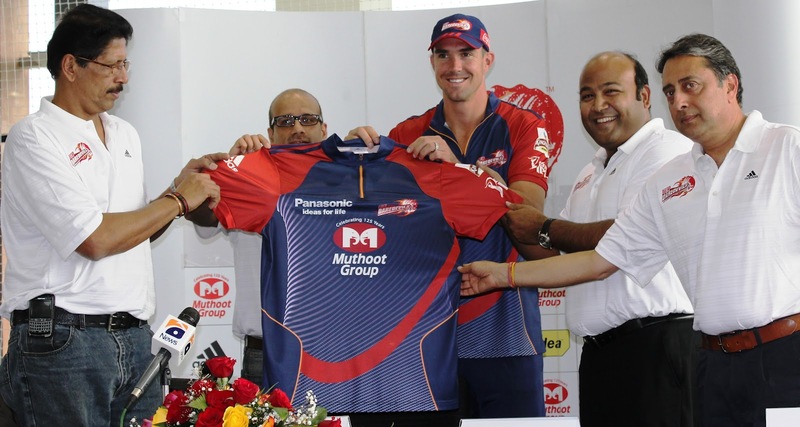 “We have also worked at adding to our ranks domestic talent who we believe can make a significant difference. For instance, we have added Delhi’s 18-year-old Pawan Negi, a left-handed all-rounder who bowls left-arm spin and can pack a punch with the bat. Gujarat’s Manprit Juneja who made a double century on Ranji Trophy debut and Saurashtra’s Kuldeep Raval are exciting talent who can play critical roles in the middle-order,” Sekar said. A much improved squad for IPL 5, with excellent new internationals like KP. Jaya, Russell & Bracewell, and good young performing Indians (like Irfan, Umesh and Aaron for the national team; also N Ojha, Dinda, Bisht). Rao, Chand, Mishra & Agarkar are also there. Can't help thinking this is going to a big season for the Daredevils. Would love someone thoughts on the playing XI. No problems at all with the batting.The middle order looks very strong.If any one in the middle order is not performing,we hav Travis Birt.Bowling seems slightly weak.